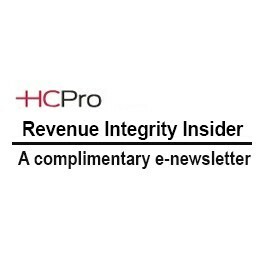 Stay up to date on the progress of the National Association of Healthcare Revenue Integrity—including the development of a credential for revenue integrity professionals—through this e-newsletter, Revenue Integrity Insider. Receive updates about the National Association of Healthcare Revenue Integrity (NAHRI), a new association dedicated to providing revenue integrity professionals with the resources, networking, and education needed to foster this growing field and profession. NAHRI held its first advisory board meeting December 12 to provide board members with the opportunity to gather and discuss the needs of revenue integrity professionals in today’s healthcare landscape. Advisory board members are busy getting to work defining the association’s mission and other standards, as well as developing forms, tools, and resources designed to help revenue integrity professionals succeed in their current roles—and their careers. Access to a resource library of forms, tools, etc. In the meantime, you can stay up to date on the progress of NAHRI—including the development of a credential for revenue integrity professionals—through this e-newsletter, Revenue Integrity Insider.